i was away in littlehampton for the first week of the month, and nothing much happened there, so i probably won't bother to put my pictures on here. on sat 11th there was a march organised by 'against crime together for south africa' through london from temple gardens next to temple underground station to whitehall place. 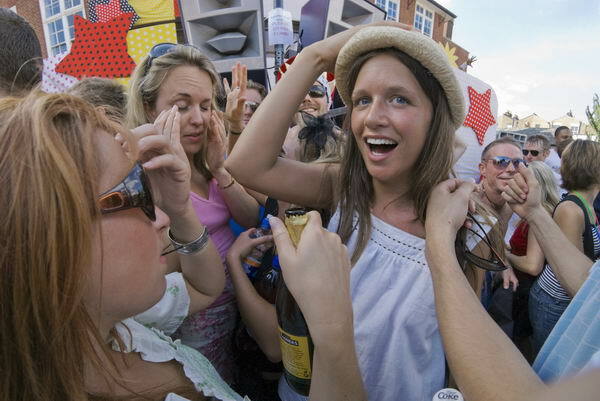 most of those taking part were young and white, but there were just a few darker and older faces. act4sa is a 'facebook' group of expatriate south africans living in london, and their aim is to be a non-political group actively working for a safer south africa. their attempt, particularly this march has attacted both praise and criticism from both other expats in britain and people back home. some in south africa have suggested they should either come back to the country to help in the fight against crime or keep a decent silence about it abroad. a stated aim of the march was to support the south african police, but at least one police superintendent there has spoken out against it. after mark joubert was murdered in a durban restuarant in may this year, around 15 of his friends living in london decided they would get together and do something to oppose the violence in their home country. 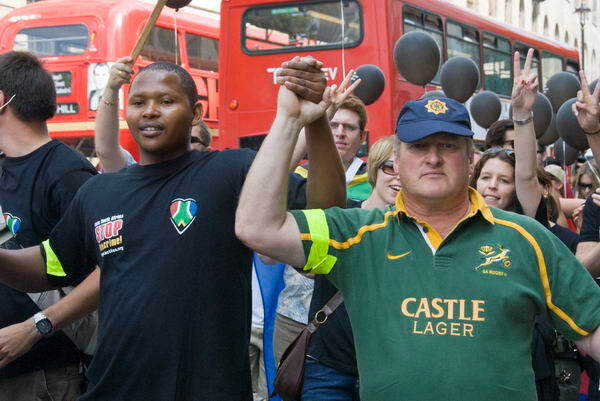 shannon joubert, mark's sister, addressed marchers briefly at the start of the march, and a minutes silence was observed by the over 600 marchers at the end of the route in whitehall place in honour of mark and the "the 50 other South Africans murdered on average every day" in the country. 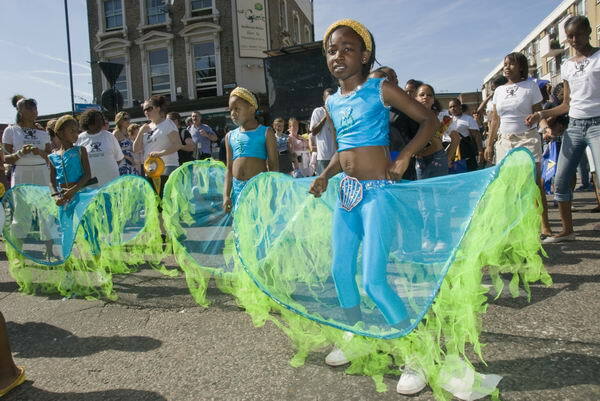 'i love peckham' is a festival backed by southwark council and based around the centre of peckham. 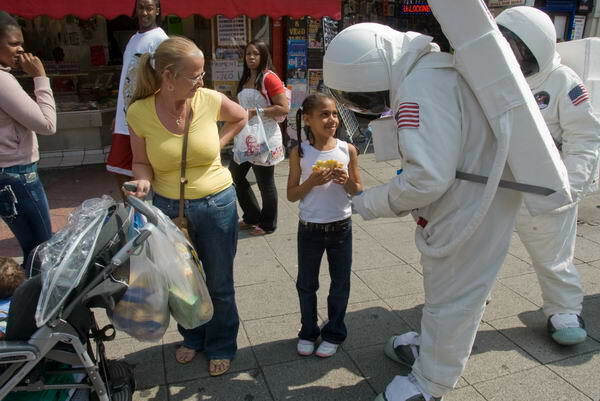 although peckham has had a bad press - particularly over the murder of young damilola taylor in november 2000, an more recent violence on the streets, many parts of it are pleasant streets and vibrant shopping areas. recent investment - particularly since the murder - has led to a number of improvements. one of the more succesful regeneration projects has been in the bellenden road area which is home to a number of artists including tom phillips and antony gormley, both of whom have been involved in brightening up the streets. but there are still estates with corners that can hide dangers, and times when its wise to cross the road to avoid the dealers in their cars. its an area where it pays to be streetwise. as well as the activities in the square by the library and at the top of rye lane i photographed on saturday there were also other events, including a series of shop window displays. Like the other folks carrying built-in cameras on their latest mobile phones i did photograph some of these, but often felt that some of the other windows which had their normal displays were more interesting. but then i've always had an interest in shop windows, which feature strongly in projects such as 'ideal café, cool blondes and paradise. on the main stage by peckham library were performances by indian musicians, a samba group and some young dancers from peckham. around the square were a number of sofas specially decorated for the occasion, many of which were greatly appreciated. 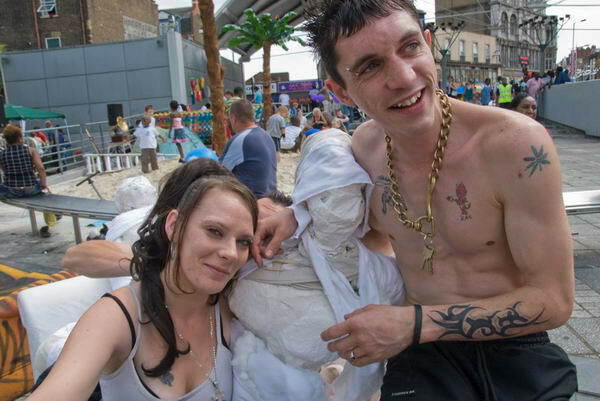 this was the third annual i love peckham festival, but the previous ones had been blighted by british weather; today the sun shone on us at least most of the time, and the beach at times looked almost tropical. i stopped off on the way home at the south london gallery, where the installation of isa suarez's human rights jukebox was coming to an end. i was pleased i'd stopped by to watch the video of the event and to have a beer and talk to a few of those involved with the project, including isa herself. i still find it mildly amusing to see myself on film, and there were glimpses of me (mainly my back) taking picutures, walking in the march, generally scurrying around and rather too lengthy a shot as i munched on a wholemeal sandwich. despite these few moments, it was interesting to see the event again and from a different viewpoint. i was sorry i had to rush off to be home with friends. 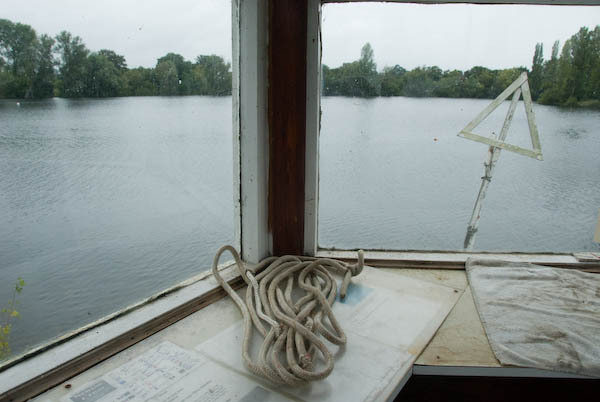 wraysbury, between staines and slough, is an odd kind of place, because most of it is water. the thames provides a border along the south-west, including the site where magna carta was possibly signed (though close to the church in staines itself is probably a more likely venue) and most of the rest of the area is covered by the water-filled lakes of former gravel pits, along with various minor streams of the colne such as the wraysbury and wyradisbury rivers. 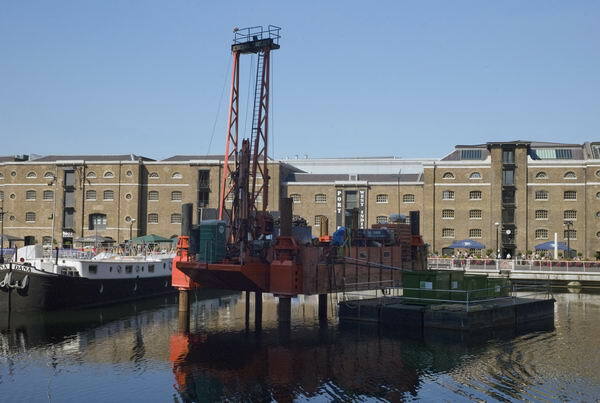 to the north, across the railway line, are more water-filled pits and two of london's larger reservoirs. wraysbury itself is a number of narrow strips of settlement on the sides of the roads that were left when the remaining land was excavated. most of the gravel pits were worked out over 50 years ago, and it was cheaper to leave them unfilled than restore them. doubtless most now are a part of the green belt that helps prevent development. although footpaths - often on narrow strips of land left between gravel lakes - run through some of the area, the largest lake of all is largely invisible to the public, with just the occasional glimpse as you travel around the area. many of these former mineral workings are now well-used recreational facilities, with sailing clubs, water-skiing and of course fishing. the club we visited is often crowded with people coming to sail, but we were there on a cool, wet day when little was happening. on sunday i cycled through the light rain to the shree ram mandir (temple of lord rama) in king street, southall, which was apparently the first hindu temple established in britain, although recently rebuilt. they were holding thier janam ashtami shobha yaatra, a procession in honour of the birth anniversary of krishna which this year is on september 4.
i have to admit to finding the hindu religion confusing, but processions such as this are lively and colourful events even if their full appreciation may require a rather different mindset to mine. it is easy to share the feelings of celebration and of community, and to feel the welcome given by so many. i also met for the first time the newly elected mp for ealing southall who held the seat for labour in last month's by-election, virendra sharma, taking part in the procession; many were eager to pose for their picture with him. i took a route back from southall along the north side of heathrow, close to the climate camp. on my way to southall, along the great south west road which runs along the south-east of the airport, i'd been stopped and searched by police at hatton cross. its a power that police are using more and more - on average around 11,000 a month in london now, and one that makes me feel uneasy. we now seem to be in a kind of police state i've certainly never voted for and don't wish to live in. i won't appear in the met's figures, despite being searched in london, as the two officers concerned had been drafted in from surrey for the day. they were polite and we had a pleasant enough conversation, but to me it still seems an unreasonable intrusion. under section 44 of the terrorism act 2000, the police can search anyone in an area designated as likely to be the subject of a terrorist attack - such as airports. they don't need to have any grounds to suspect you, being there is enough. cycling back along the pavement by the bath road (a shared path) there were rather more police around, but they were too busy with more likely targets to stop me. as i came along the road i found myself riding along with a woman who was obviously hurrying to get somewhere. 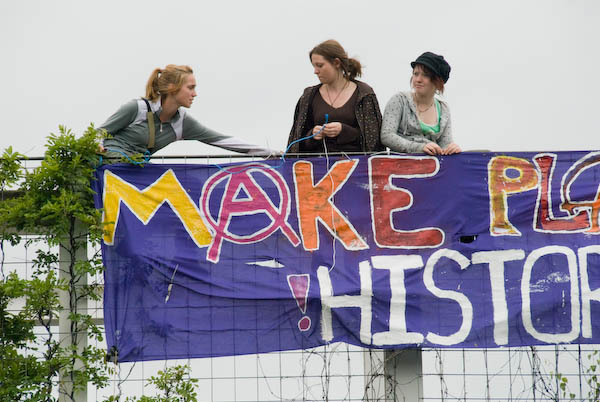 we both stopped at the same point, opposite where three activists had scaled the side of a small building with a banner reading "MAKE PLANES HISTORY". she jumped over the fence between the two carriageways to approach the protestors, while i stayed on the opposite side from where i had a better view. later she came back to talk to the tv crew beside me and was talking to one of the protesters - obviously she was proud of her daughter's action. and she had every right to be proud. we need action over heathrow, action to prevent the takeover of even more land for the third runway. i've long opposed the expansion of heathrow - and was on the local march against the third runway. now there shouldn't even be a possibility of further expansion, but the government must look at ways of running down the activities at heathrow, or it will be failing not just west london but the world. further along the road i found protesters gathering around the british airports authority offices, which were ringed by police. nothing much seemed to be happening and the media were there in force, so i left the guys to it. 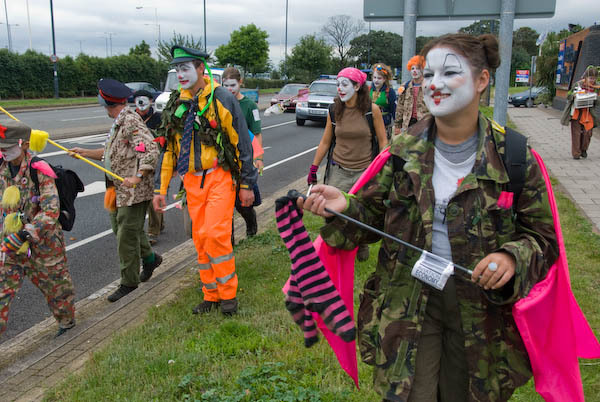 i'd previously been upset by the restrictive media policy adopted by the climate camp, which had the effect of preventing sensible photographic coverage of the event. so i was rather less interested than i might otherwise have been in putting myself out to take pictures. along the road i met a few groups of demonstrators and did take a few pictures of them, including some on the bridge over the road into the airport, and a couple of the clown army being harassed by a police photo team, but my heart still wasn't really in it. 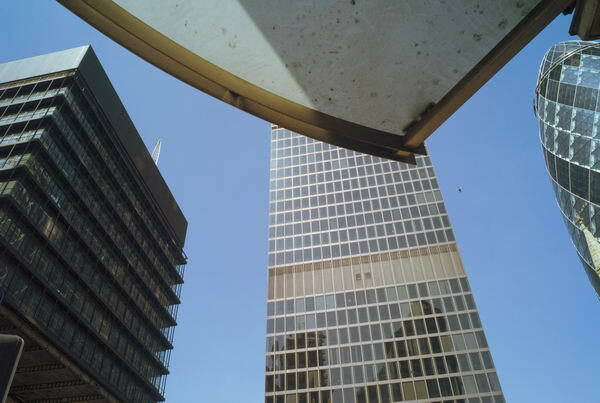 the british airways offices had seemed to me a likely place for a confrontation - and obviously the police had thought so too, as teams of black clad figures paced up and down spoiling for a fight, watched over by the guys in uniform and a group of suits. at the top of the mound in front of the offices were a couple of officers on horses. it was like some painting of the field lining up before a medieval battle, and i wish i'd stopped to take a picture, but they were so obviously looking for trouble i decided i didn't want the aggravation that this would most likely have caused. for once you will just have to imagine it! lacock abbey has a special place in photography, as the home of william h f talbot, the inventor of the first practical positive-negative process. as a young boy i saw his first negative in the london science museum. the abbey has belonged to the national trust since 1944, and i think fairly sensibly, they do not normally allow photography inside their properties. so it's nice to see that there is a special exemption for the window with its many glass panes that was the subject of talbot's first negative. my lens has a rather wider angle of view than his mousetrap, and the exposure was considerably shorter. 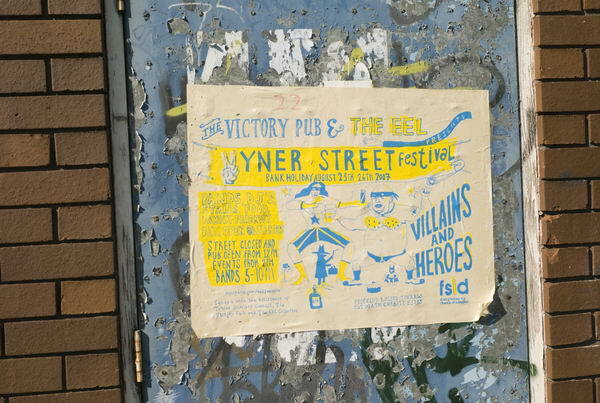 the vyner street isn't notting hill, but could be interesting. the area is on the edge of the regents canal at the northern edge of bethnal green. unfortunately, although the pub opened at 12, and the event started at 2pm, the bands didn't start until 5pm, and there wasn't and awful lot happening before then, as you can see from my pictures. Well, there was an angel with red wings. 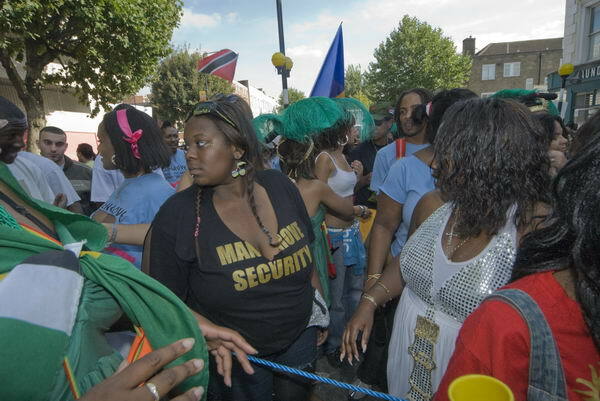 on notting hill childrens day, the sunday before the carnival proper, perhaps the children get a little more attention, but many of the adults are there and performing too. its a day with more madness and mayhem too, with flour, chocolate and water being thrown around rather too freely at times. fortunately whatever they were using this year washed out without problems. one of the highlights for me was a visit to sancho panza sound system, in the middle of one of the biggest crowds anywhere. 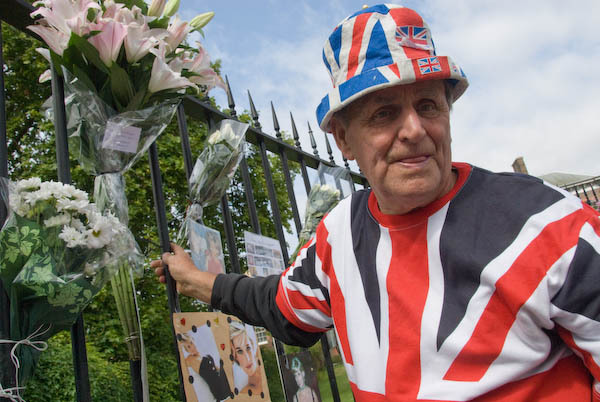 ten years ago we woke to hear that princess diane had been killed in a car crash. i don't take a great deal of interest in royalty - i didn't ask to have a queen after all, and i certainly wouldn't have chosen the windsors or any of their relatives for the post. diane seems to have been a bit more human than the rest of them - sometimes behaving like a civilised, feeling person rather than royalty, and sometimes tried to use her position to do something useful. but ten years is a long time, and perhaps next year we might instead celebrate mother teresa's death. coming shortly after di's, it hardly made the news. The lake is often full of yachts, but we had it more or less to ourselves. 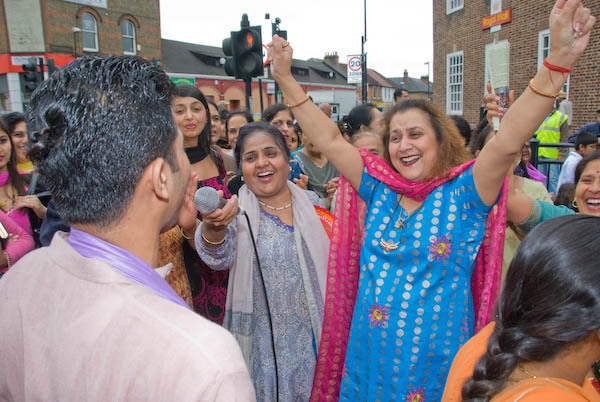 The parade on the streets of Southall for the birth anniversay of Sri Krishna. 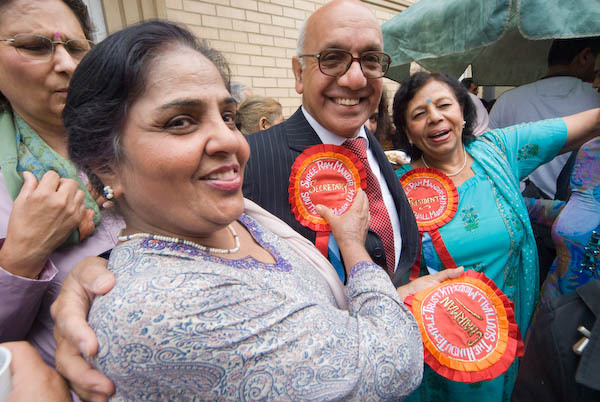 Virendra Sharma, elected last month as Labour MP for Ealing Southall outside the Shree Ram Mandir. Lacock Abbey is a National Trust property, and this photograph and others in its grounds were taken on an amateur basis. These images are still copyright, but unlike others on this site they are not available for reproduction. 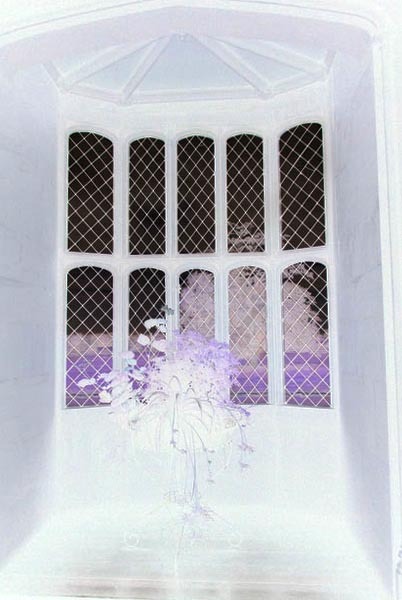 W H F Talbot made the first known photographic negative of this window. It showed rather less than mine. 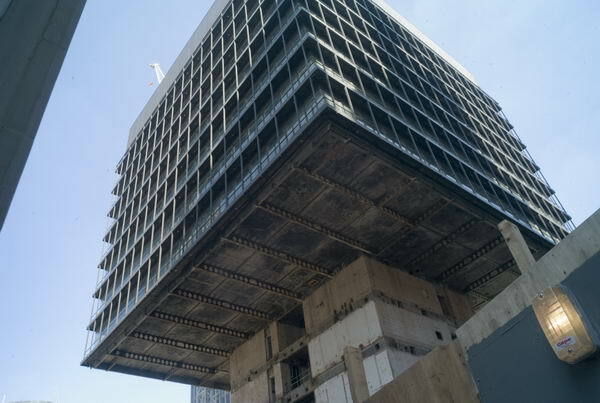 Leadenhall St, City of London - demolishing a building from the bottom up. Villains and Heroes were promised but where were they when I wanted them? Taking a rest in the van. Perhaps its time to let go? But not for some.